In the Hindu tradition, the Matrkas are groups of goddesses with various origins that are associated with violence and diseases that afflict children (Bose 36). In literature, these goddesses are often presented with more recognizable goddesses such as Kali’s precursor Camunda (Donaldson 301) and the Great Goddess Devi in battle (Donaldson 305). The size of the group of goddesses varies throughout literature and mythology, and early references to the group of “mothers” mention their innumerable size (Kinsley 1986:151). Eventually, the representation of the Matrkas evolved from unspecific groups of goddesses to an organized unit because of development in the Brahmanic tradition (Harper 97). The group is unique in that each individual goddess holds little significance and is therefore difficult to describe individually but they garner significance when mentioned as a group (Kinsley 1986:158). The Matrkas are featured most prominently in the third episode of the Devi-mahatmya (Kinsley 1986:156) but are also featured in the Mahabharata (Kinsley 1986:152) and Puranic literature (Harper 52) both as the Matrkas and the Saptamatrkas, a specified Tantric group of seven goddesses. These goddesses are not often worshipped like other significant goddesses, however worship is done for specific circumstances both in literature and tradition. Although these goddesses do not have one specific role within religious tradition, they have a very interesting origin and place within Hinduism and Indian culture. The origins of the Matrkas is cautiously believed to be a synthesis of both Vedic and tribal goddesses that were worshipped regionally (Foulston 107). These goddesses were all seen as mother goddesses that could cause harm to children and were often featured in battles (Donaldson 301). Due to the belief that the Matrkas are drawn from tribal village-goddesses, epics and Brahmanic traditions are weary of the goddesses, possibly contributing to their negative depiction (Kinsley 1986:155). Iconographically, the Matrkas are mostly represented in calm and maternal form, often holding a child and in some instances emblems of their supposed male counterpart (Donaldson 320). These visual depictions of the goddesses heavily contrast with their physical descriptions that emphasize their fearsome natures and frightening features (Kinsley 1986:155). Early references rarely specified their number, and it is unclear whether the same goddesses were involved every time they were mentioned (Kinsley 1986:151). During the medieval period though, and possibly after being merged into Brahmanic tradition, the number of goddesses in the group were standardized and named. Most often there are seven goddesses, the Saptamatrkas, but groups of eight and sixteen were also used in literature (Kinsley 1986:152) with up to 24 Matrkas being mentioned by name (Donaldson 318). How the Matrkas are created differ throughout the literature, however it is agreed upon that rather than divine consorts or saktis of male gods as mentioned in the Devi-mahatmya and the Devi-bhagavata-purana, they are extensions or forms of the Great Mother or Goddess, Devi as mentioned in Puranic literature (Bose 36). The popularity of these goddesses increased after 400 CE due to many casual references in literary works (Kinsley 1986:55). The Matrkas are featured in many literary works. Most prominent is the third episode of the Devi-mahatmya, however it draws on a tradition that was established in the Mahabharata (Kinsley 1978:494). In the Vana Parva, the narrative of Karttikeya is told. 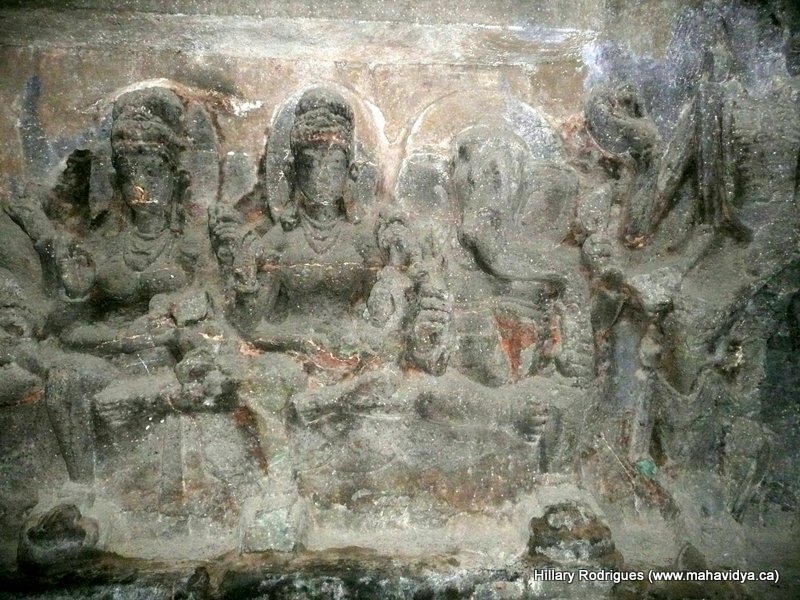 In this, a group of goddesses were sent by Indra to kill Karritkeya but when they arrived they developed maternal instincts towards him and were unable to kill the child. Instead, they ask him to adopt them as his mothers. They also requested that they be elevated and worshipped in the same position as Brahma’s and Siva’s consorts as the “mothers of the world” and for permission to live off the offspring of man (Kinsley 1978:495). Karritkeya denies the last request, asking that they protect children. However, he adds a caveat that they may torment children with disease and ailments up to the age of 16. The Matrkas’ desire to be mothers and to punish men through harming children stemmed from their own lost opportunity to bear children due to their divorces (Kinsley 1986:152). Further mention in the Mahabharata includes when Karttikeya is given command of the army in which the Matrkas assist him in battle (Kinsley 186:153). The Matrkas in the Devi-mahatmya are similar to those in the Mahabharata including their ability in battle and dangerous nature (Kinsley 1975:496). The third episode of the Devi-mahatmya includes the formation of the Saptamatrkas from the saktis of seven gods (Donaldson 304) to assist Camunda, precursor to Kali, defeat Raktabija during Devi’s battle with demon brothers Sumbha and Nisumbha (Donaldson 303). The goddesses created closely resemble the saktis they were created from (Kinsley 1986:156) but it is believed by scholars that the story in the Devi-mahatmya references a group of seven goddesses that are further representing a larger group of village goddesses (Kinsley 1978:496). This story is echoed in the Devi-bhagavata-purana (Kinsley 1986:156). In Puranic literature, the Matrkas are always featured in battle in a supportive role (Kinsley 1986:160). In the Vamana Purana, the story stays similar to the battle in the Devi-mahatmya, however the goddesses are formed from various parts of Devi’s body (Donaldson 305), adding evidence to the belief that the goddesses are an extension of Devi herself. In the Matsya Purana, Siva created the Matrkas to help combat the demon Andhaka, who possessed the ability to duplicate from the blood spilled from his wounds. The Matrkas were instructed to drink the blood of the demon in order to kill him; because of their bloodthirsty nature they gladly complied with Siva’s request (Kinsley 1986:158). However, the blood intoxicated the Matrkas, and Siva was unable to control them or convince them to return to protecting creation, thus beginning their destructive bloodthirsty path (Donaldson 310). The Varaha Purana is based on three battles mentioned in the Devi-mahatmya, however the demons change and Camunda is dominant rather than Devi (Donaldson 308). In this version, the Matrkas were created from Camunda’s mouth and when they emerged, they were deformed and bloodthirsty. In order to control them, Siva set out guidelines for how they should quench their thirst (Donaldson 309). Puranic writers are credited with making the Matrkas mainstream through the simplification of the origins and personalities of the group. The goddesses are restricted in number, are related to male gods in name and depiction and to draw away from their dangerous nature, the Puranic writers focus the Matrkas role to assisting Devi in maintaining cosmic order (Kinsley 1986:158). This intention could stem from a need to incorporate the goddesses into the Brahmanic tradition, however it is still understood by scholars that this group is dangerous and violent, especially towards children (Kinsley 1986:160). Although the Matrkas are mentioned in varying numbers, seven goddesses are most often referred to as the Saptamatrkas. The significance of the number seven stems from the Indus Valley Civilization, in which seals have been discovered featuring seven female figures that are believed to be “officiants or ministrants of the goddess” (Harper 6). In addition to the seals, the heptad recurs so frequently that it implies the heavy significance of the number seven in Indus culture (Harper 6). In early folk tradition, there were many groups of seven female deities that brought disease and bad luck (Harper 34) and communities would often be subject to these various deities’ wrath for disregarding their worship and as a result be plagued with various diseases and ailments (Harper 41). In Vedic literature, the heptad is also very prominent. The Rg Veda contains the division of the universe into seven regions and in the Artharva-Veda and Kathaka Samhita there are references to seven suns (Harper 13). Even though it seems that the origin of worship to female heptads did not emerge from Vedic literature but rather aboriginal or tribal traditions, the number seven in both cultures seems to represent regeneration of people and the universe (Harper 45). The Seven Goddesses, Saptamatrkas, of Vedic literature are adaptations of village goddesses and because the village goddesses and Vedic goddesses share many characteristics, they were mutually acculturated in order to be incorporated in Hindu tradition (Harper 52). They are a systematically refined form of the earlier Matrkas that represent the Great Goddess Devi and the cosmic powers of creation, preservation and destruction (Foulston 109). The goddesses named are Brahmani, Vaisnavi, Mahesvari, Kaumari, Varahi, Indrani and Camunda (Foulston 111). The names of these goddesses are similar to the male deity whose sakti they were formed from, however, it is understood that they are not in any way consorts of male deities instead are from the sakti and body of Devi (Foulston 111). Identified as tantric goddesses, they were very popular between the fourth and sixth centuries (Foulston 109). The similarities between the significance of seven and of the Seven Mothers allowed for the mutual acculturation of the Saptamatrkas between Brahmanic and aboriginal traditions (Harper 52). When the Saptamatrkas were accepted into orthodoxy, through being featured in Vedic literature, they contributed to the recognition of some aboriginal deities in Brahmanic worship. As the Matrkas are associated with harm to children, most worship that is directed at them is essentially to keep the spirits of the goddesses away from their families. This includes shielding children’s beauty from the world, both in speech and in reality (Kinsley 1986:154). Most worship of these goddesses is done in fear of what may come; however they are worshipped for positive reasons as well. The Saptamatrkas are often worshipped for personal spiritual renewal, which touches on the shared belief that the Seven Mothers represented renewal and rejuvenation (Foulston 112). In the Kadambari, Queen Vilasavati worships the Matrkas because of her desire to have a son (Kinsley 1986:156), possibly implying that the Matrkas can influence fertility. The Nayta-sastra speaks to worshipping the Matrkas before setting up a stage for theatre and dance and presenting offerings to the Matrkas at times of indecision and at cross roads in one’s life is encouraged by both Caruddatta of Bhasa and Mrcchakatika of Sudraka (Kinsley 1986:155). The Matrkas have a vast and diverse history in both Vedic and folk tradition. Their origins and nature differ through the course of Hindu literature. It is generally understood that they are extensions of Devi and are often featured as bloodthirsty and very dangerous. They are dangerous to children and very formidable in battle. However, their portrayal in Hindu iconography portrays them as soft maternal figures. This juxtaposition brings out the two sides of the goddesses that are mentioned in the story of Karritkeya, maternity and danger. It is evident that the Matrkas have evolved over time to fit in the Brahmanic worldview, although their fearsome, dangerous nature remains embedded in both orthodox and folk tradition. Donaldson, Thomas (2002) Tantra and Sakta Art of Orissa Vol. 1. New Delhi: D.K. Printworld (P) Ltd.
Harper, Katherine Anne (1989) Seven Hindu goddesses of spiritual transformation : the iconography of the Saptamatrikas. Lewiston: E. Mellen Press. Hawley, J. S., and D. M. Wulff (eds.) (1996) Devi: Goddesses of India. Berkeley: University of California Press. Kinsley, David (1986) Hindu goddesses. Berkeley: University of California Press. Article written by: Mikayla Kwan (March 2015) who is solely responsible for its content.